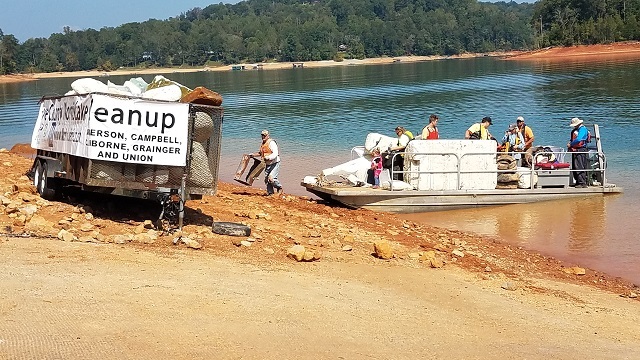 The Norris Lake Project Team is looking for volunteers to help with the Fall Five County Norris Lake Cleanups on September 22nd, 29th and October 6th. The three areas that will be targeted this year is around Lone Mountain Shores on September 22nc, Waterside Marina on September 29th and Twin Cove Marina on October 6th. All cleanups will start at 9 a.m. with registration and end at 1 p.m. The launch locations can be found online at www.norrislakeproject.com/upcoming-cleanups/ or call 865-457-4547 for location information. There will be boats available to shuttle volunteers to and from the cleanup sites that are not accessible by land and barges will be used to transfer the trash back to the shore. However, volunteers are welcome to bring their own boats. All volunteers are encouraged to wear appropriate shoes, preferably boots, bring gloves and bring a life jacket. The Norris Lake Project Team is a grassroots effort of individuals, organizations, businesses and agencies to preserve the water quality of Norris Lake, conserve the land surrounding the lake and encourage the stakeholders of the lake to do their part in keeping Norris Lake the cleanest and safest recreational asset in Anderson, Campbell, Claiborne, Grainger and Union Counties. If you are interested in volunteering, visit www.norrislakeproject.com to find a location near you, to register and get more information. Volunteers can also register the morning of the cleanup. Please note that minors must be accompanied by an adult and have a registration and release form signed by a parent. You can also call 865-457-4547 or email info@norrislakeproject.com for more information. The Norris Lake Project Team is a partnership with the Anderson County Tourism Council, Campbell County Chamber of Commerce, Union County Chamber of Commerce, Norris Lake Marina Association, Middle East Tennessee Tourism Council, Tennessee Valley Authority, Tennessee Wildlife Resource Agency, Tennessee Department of Environment and Conservation, Norris Dam State Park, Big Ridge State Park, Anderson County Litter Grant, Campbell County Litter Control, Highlands HOA, Norris Shores HOA and Lone Mountain HOA.